The 2016 IMSA season opened at Daytona International Speedway in January with the traditional Rolex-24. It was followed by the historic 12-Hours of Sebring, Long Beach, Mazda Raceway Laguna Seca, Detroit, Watkins Glen, Canadian Tire Motorsport Park, Lime Rock, Road America, Virginia International Raceway, Circuit of the Americas and a 10-hour finale at Road Atlanta. Prototype (P) – These are purpose built race cars and the quickest in the series. Included in this group are Daytona Prototypes from the former Grand Am series and P2 cars. Manufacturers such as Ford, Chevrolet, Honda and Mazda are supplying engines that produce 550-600 horsepower. Chassis’ competing in the category include the Corvette DP, DeltaWing DWC 13, HPD ARX-04b, Mazda/Lola, Riley DP, Ligier JS P2 and Ford DP. GT Le Mans (GTLM) – Cars in this class are highly modified production vehicles from manufacturers such as Ferrari, Porsche, Chevrolet, Ford and BMW. As a result, a wide range of engine configurations and displacements are employed. The series technical staff uses a number of methods to ensure that teams are competing on a ‘level playing field’. Most of the teams competing in this group are receiving factory support. GT Daytona (GTD) – This is also a production based class but does not allow the same level of technological improvements that can be made to GTLM cars. Vehicles in the category include Audi R8 LMS GT3, Porsche 911 GT3-R, Ferrari 488 GT3, Lamborghini Huracan GT3, BMW M6 GT3 and Dodge Viper GT3-R. Similar to GTLM, the technical staff uses a number of methods to ensure parity. 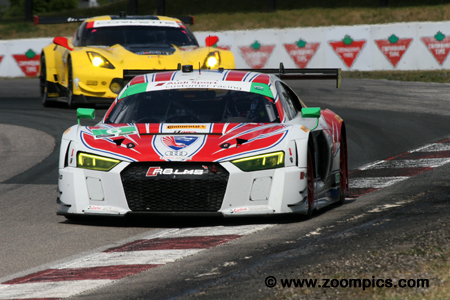 Canadian Tire Motorsport Park hosted the seventh round of IMSA’s WeatherTech series. Forty entries would compete in the 2-hour and 40-minute race around the 2.459-mile ten-turn road course. Second fastest qualifier, Ricky Taylor in the No. 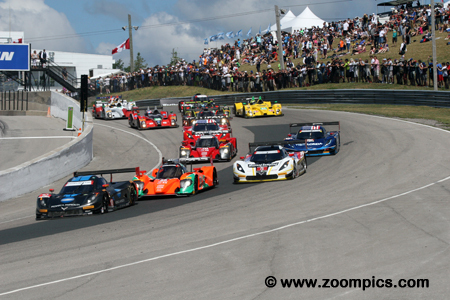 10 Chevrolet Corvette DP beats the Mazda-powered Lola of Tristan Nunez to Canadian Tire Motorsport Park’s first turn. Taylor would lead the first eleven laps before being passed by Nunez. Behind this pair are the Corvette DPs of Christian Fittipaldi and Marc Goossens and the second Mazda/Lola entry of Tom Long. Eric Curran qualified the Action Express Chevrolet Corvette DP in the fifth grid position. Curran and co-driver Dane Cameron moved into the lead on lap-31 and dominated the remainder of the race. They were first overall for the final thirty-six laps and able to hold off a challenge from the teammates – Joao Barbosa and Christian Fittipaldi. The pair won their first race of the season by a margin of 17.067-seconds. Tristen Nunez put the No. 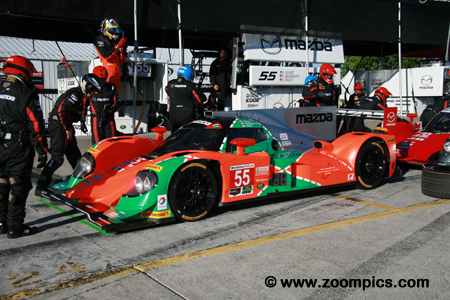 55 Mazda powered Lola on the pole. 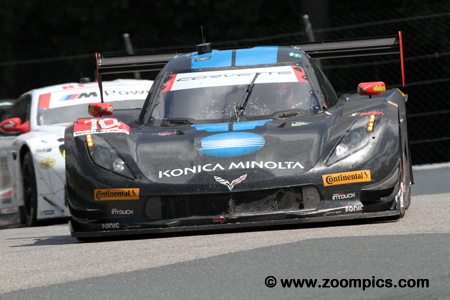 At the start, Nunez was beaten to the first corner by Ricky Taylor in the Konica Chevrolet Corvette DP. Nunez took the lead on lap-11 and led until he pitted twenty-five laps later. During the stop to change drivers, tires and refuel the car’s air jack failed. Co-driver Jonathan Bomarito rejoined the race in fifth and eventually retired with a driveline issue. The No. 67 car started third and was driven by Richard Westbrook and Ryan Briscoe. 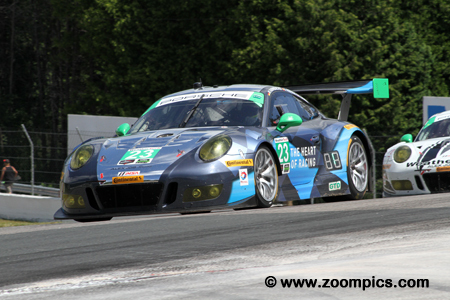 The pair was victorious the previous weekend at Watkins Glen. During the first part of the race, they maintained their starting position. The team made their final pit-stop during a caution period while the competition pitted later - during green flag conditions. 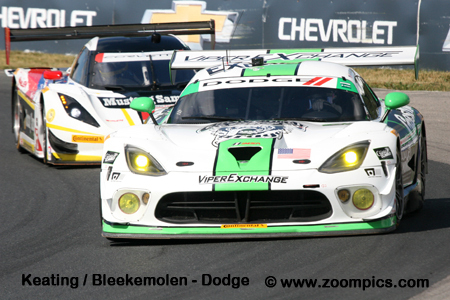 This strategy vaulted them into the GTLM lead which they held to the checkered flag. 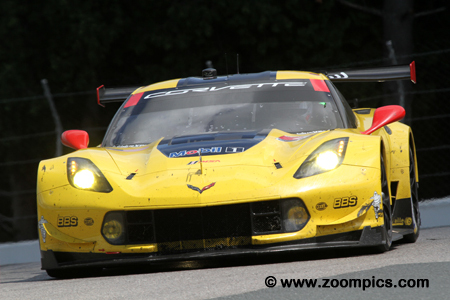 Oliver Gavin started the Corvette Racing Chevrolet Corvette C7.R from the sixth GTLM grid position. 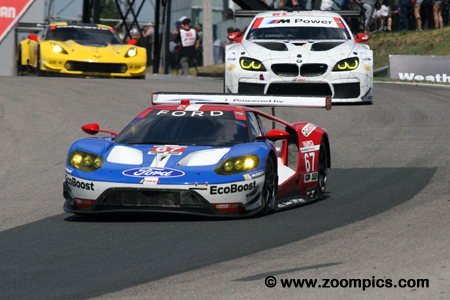 Gavin and teammate, Tommy Milner made steady progress during the race and by lap-100 were trailing the class leading Ford GT of Richard Westbrook and Ryan Briscoe. Milner was behind the wheel for the final stint, closed the gap on Briscoe but finished second just 1.452-seconds behind the GTLM winner. The No. 23 Alex Job Racing Porsche 911 GT3 R was shared by Alex Riberas and Mario Farnbacher. Riberas qualified the car and won the GTD pole position – this was his second of the season - the first came at Mazda Raceway Laguna Seca. The pair dominated the first half of the race but with just over an hour remaining in the event, they lost the left-front wheel. This incident dropped them to a twelfth place finish in GTD. 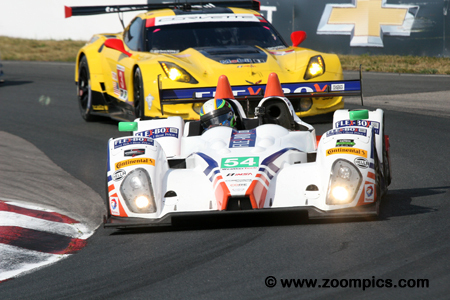 Defending winners of the Mobil 1 Sportscar Grand Prix were Ricky and Jordan Taylor sharing the No. 10 Konica Minolta Corvette. Ricky qualified second, just 0.209-seconds behind pole-sitter Tristan Nunez. At the start, Taylor got the jump on Nunez and led the field into the first corner but lost the lead eleven laps later. 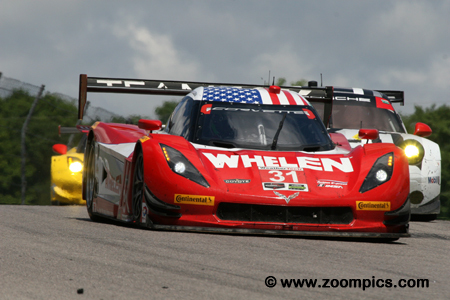 At the checkered flag, they completed a sweep of the podium for the Chevrolet Corvette DP. 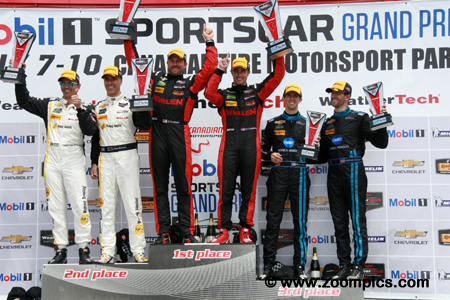 The overall and Prototype class podium at the 2016 Mobil 1 Sportscar Grand Prix. To the left are the runner-ups from Action Express Racing - Joao Barbosa and Christian Fittipaldi. 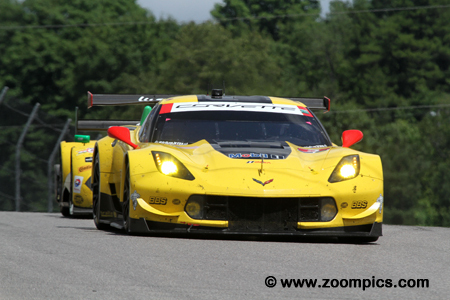 And, on the right completing an all Chevrolet Corvette DP podium are the Taylor brothers – Jordan and Ricky. In the center, victorious for the first time in 2016 are Dane Cameron and Eric Curran. 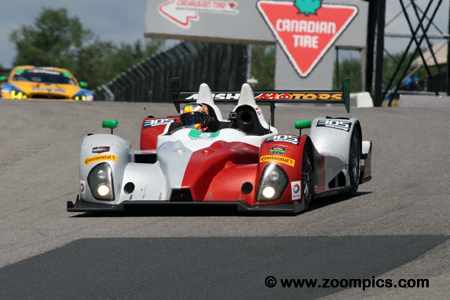 The Core Autosport ORECA FLM09 was shared by Colin Braun and team principal John Bennett. Qualifying duties were assigned to Braun and he won his second PC pole position of the 2016 season and set a new track record in the process. However, the team made a decision to have Bennett start the race which meant the car was moved to the rear of the PC grid. The duo worked their way through the field and with less than 30-minutes remaining Braun took the lead and went on to victory. 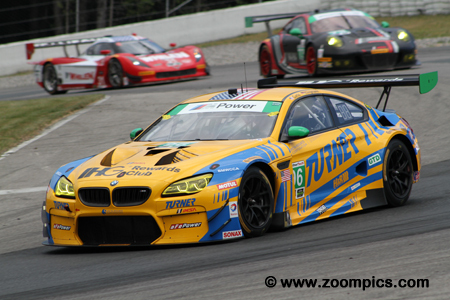 Bret Curtis put the Turner Motorsport prepared BMW M6 GT3 fourth on the GTD grid. As the race entered the final 30-minutes Curtis’ co-driver Jens Klingmann found himself third in class. But a pass at Moss corner on the second place Dodge Viper GT3-R and class leading Lamborghini driven by Fabio Babini allowed Klingmann to take first in GTD. He held the position to the checkered flag winning by a margin of 7.720-seconds. Stevenson Automotive Group entered two Audi R8 LMS GT3s. The No. 6 Audi was qualified by Andrew Davis and he set a time that put he and co-driver Robin Liddell second on the GTD grid. During the late stages of the race, the Audi ran fourth but an incident between the third place Dodge Viper and the Lamborghini in second promoted Davis and Liddell to the runner-up spot in GTD. It had been a number of races since a Corvette won the GTLM pole – 2015 Rolex 24 at Daytona. Antonio Garcia finally put Chevrolet Racing at the top of the GTLM qualifying sheet. Garcia led the class in the opening stint and his co-driver Jan Magnussen ran first in class until lap-75 when a pit-stop dropped them to sixth in GTLM. The pair worked their way back up the race order and secured the final position on the class podium. The No. 8 Starworks Motorsport ORECA FLM09 entered the CTMP event with two consecutive Prototype Challenge wins and the class points lead. In the qualifying, Alex Popow could only manage the sixth quickest time. But a solid drive by Popow and his co-driver Renger van der Zande put them second in Prototype Challenge on lap-105. They trailed Core Autosports to the finish taking a second and maintained their point’s lead. Starting from the ninth GTD grid position were Madison Snow and Bryan Sellers in the Paul Miller Racing Lamborghini Huracan GT3. Contact between the first and second place GTD cars elevated Sellers to fifth in class. A lap later he passed the fourth place Ferrari while the Lamborghini in second pitted. 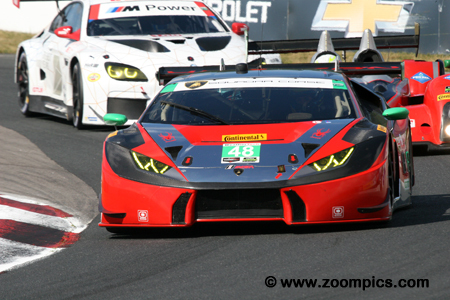 In the space of three laps, Sellers moved to third in GTD and held the position to the finish. 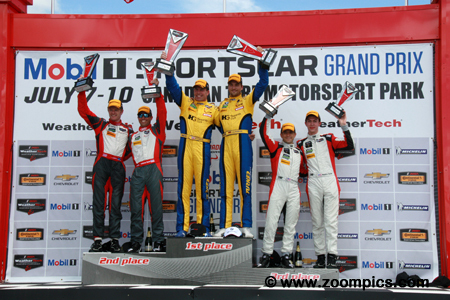 The WeatherTech SportsCar Challenge GTD podium at Canadian Tire Motorsport Park. On the left are second place finishers Andrew Davis and Robin Liddell and at the right are Bryan Sellers and Madison Snow. Sellers and Snow third place result earned the first series podium finish for the Lamborghini Huracan GT3. In the center, earning the first win for the new BMW are Bret Curtis and Jens Klingmann.